It’s that time of year when the produce starts coming in so quickly that we need to find a way to extend its shelf life. 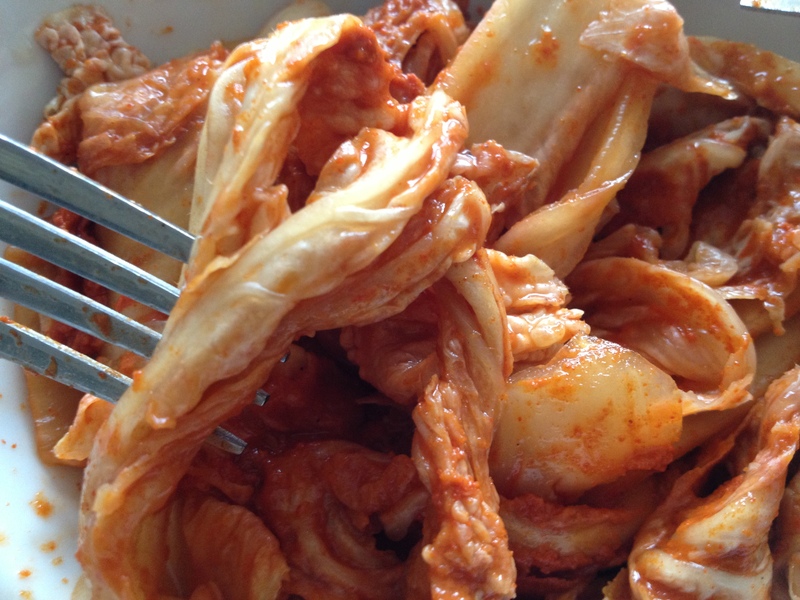 Lactic acid fermentation is used to preserve and flavor this kimchi. The fermentation imparts a happy, bubbly, almost champagne-like burst in the mouth. 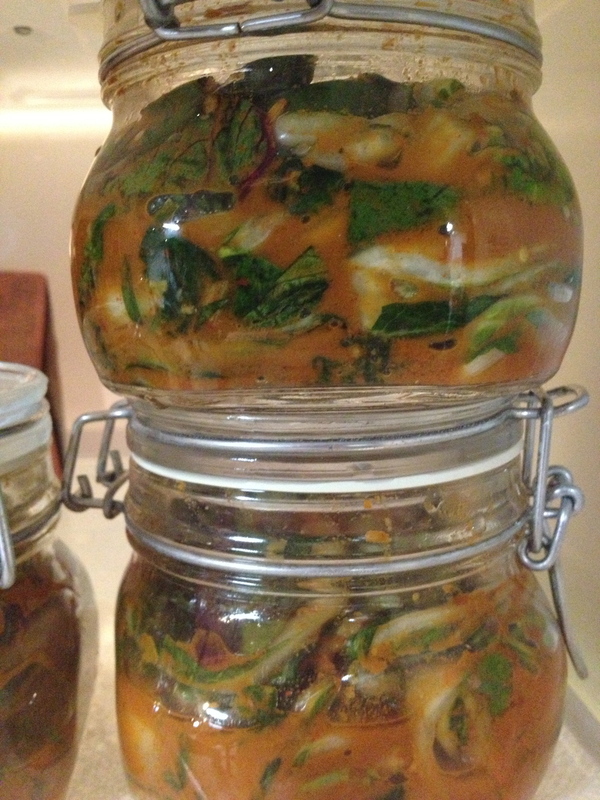 However, I must warn you… kimchi is, um, quite pungent. I guess I shouldn’t be surprised since it’s really fermenting cabbage, garlic, and fish. So intense is this aroma that husband has banned the unsealed product from our refrigerator. Therefore we learned why Korean families have a dedicated kimchi refrigerator… marital bliss! Fortunately, sealing it in glass jars does the trick to making everyone happy. * No kochukaru? Me neither! However much I like spicy, this is a perfect opportunity to dial down the intense fire. Instead I used 1/2 c paprika and 1/4 crushed red pepper flakes. I know, I’m totally getting wimpy on that authentic kimchi heat, but I’d like my family to actually eat some too. Remove and wash the cabbage leaves. Slice the leaves in half length wise. Sprinkle with salt and toss. Leave out to wilt on the counter for approximately 24 hours. Once the cabbage is wilted, add the garlic, ginger, kochukaru or substitute, soy sauce, and anchovies to a food processor and process until it becomes a paste. Toss the paste with the cabbage, scallions, and carrots. For a more pungent flavor, allow this to ferment in a cool place (<68F) in your lactic fermentation crock for approximately 24 hours. Otherwise pack it into sealed glass jars and store in the refrigerator. 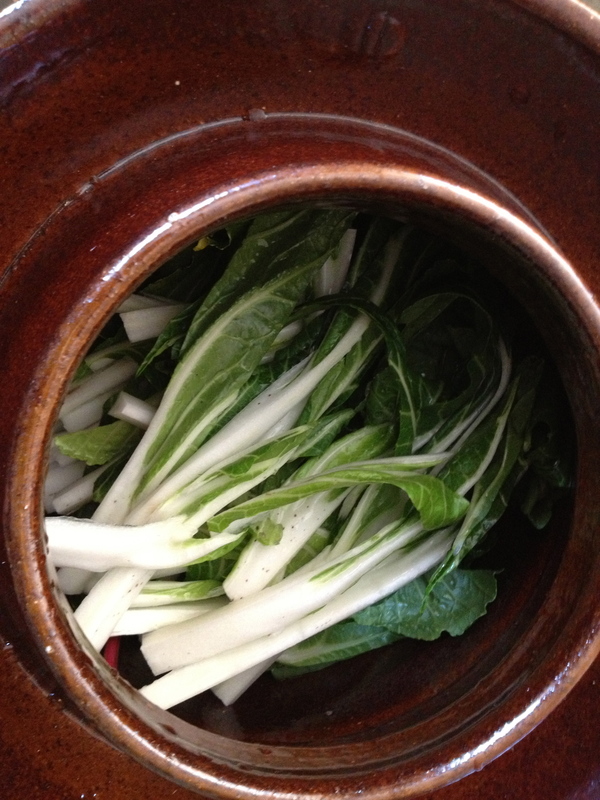 The kimchi will be ready to eat in as little as 1 day or stored in the refrigerator for months. The flavor changes over time as the lactic acid fermentation works its bubbly magic. Ps. This was an experiment using Momofuku’s Kimchi and the ingredient list on Mother in Law’s Kimchi, which is the best kimchi one can purchase at the market.